Friends don’t let friends spoil films. The same should be said of those who review them. This standard makes director Steven Soderbergh’s SIDE EFFECTS nearly impossible to explain in depth, but let’s give it a try. 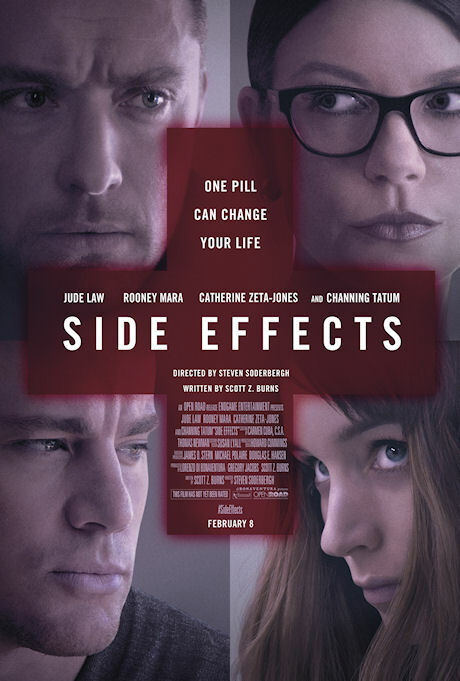 SIDE EFFECTS revolves around Emily Taylor (Rooney Mara), a woman trying to overcome depression. Emily seems hell bent on harming herself due to her mood swings, and eventually her self-destructive behavior goes too far and requires a psychiatrist, Dr. Jonathan Banks (Jude Law). Dr. Banks has too much on his plate, but has taken on pressures willingly due to money issues. He works off the advice of Emily’s former psychiatrist, Dr. Victoria Seibert (Catherine Zeta-Jones). Dr. Banks and Dr. Siebert seem to agree that Emily needs heavy prescriptions in order to fight her depression. These prescriptions lead to side effects, which are then combated with more pills. On top of Emily’s emotional difficulties, she’s trying to get her marriage back on track with husband Martin (Channing Tatum), who has just been released from prison for insider trading. The film is essentially a jigsaw puzzle that uses its characters to put the pieces together and it's spellbinding to watch how that happens, even if it sometimes feels like its spinning out of control. SIDE EFFECTS could have easily been a preachy film about the dangers of prescription pills, but Soderbergh knows there is a better film to be had than that. It’s impossible to ignore the performances given by Jude Law and Rooney Mara who are on top of their game. Both give performances that are hard to forget and are supported by a terrific supporting cast. They’re provided a strong script to work from, and Soderbergh’s steady direction. Post-Oscar season can be a punishing time for audiences at the theater, but SIDE EFFECTS provides some welcome relief. Soderbergh has been a busy man over the last two years. SIDE EFFECTS is his fourth film in that time following MAGIC MIKE, HAYWIRE and CONTAGION. No one can fault Soderbergh for a lack of productivity, as his films easily outnumber the years of his career. His largest hits include TRAFFIC, ERIN BROCKOVICH, and the OCEAN’S trilogy, proving he can make films that don’t pander to the audience that are still friendly to the average moviegoer. Soderbergh claims that SIDE EFFECTS will be his last film, and if that really is the case, it’s our loss. 3 1/2 stars out of 4. I enjoyed this movie as well and I hope this isn't his last film. I am always impressed that he not only directs but shoots and edits his films (under his different pseudonym's for each position).